Global Warming Peru Fine Art Oil Painting, "Disintegration"
Dense tangles of feathers and bone force their way skyward, almost filling an enigmatic canvas by Theus. A passionate ecologist, the Andean artist expresses his anxiety through color. "My theme is global warming and birds as its victims. They are dying slowly due to our indifference," he laments. 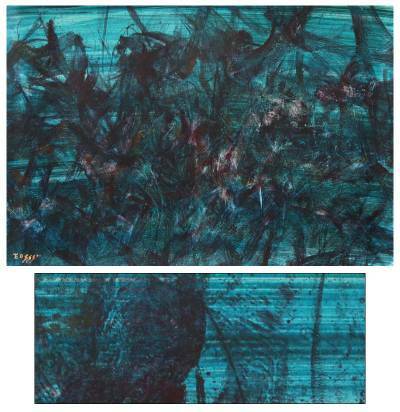 You can find 'disintegration' (2011) by Theus in paintings categories such as Floral Paintings, Abstract Paintings and Oil Paint Paintings. Enjoy exploring these sections for other Novica treasures.